Soooo, I love Hollywood love stories. This is totally one of my favorite tropes in romance. After The Glitter Fades by Diane Marina gave me just the Fix I needed with two Tinsel town starlets with that great push-pull relationship. Siena Armetta is one of Hollywood’s darlings. As one of the most sought after and influential film stars, Siena has a reputation to uphold. 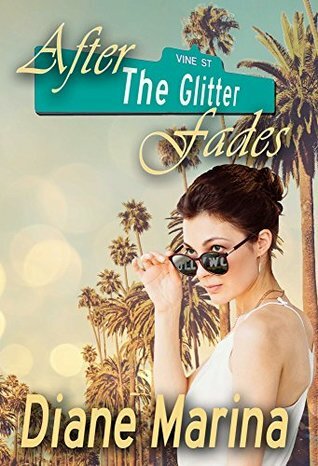 She guards her privacy fiercely, only a few friends, family and her ex-husband are allowed to know the real Siena and know that she is a lesbian. Siena sees no way out of the closet, she left her adoring husband because of her sexuality but since that step, she’s lead a lonely life of work and little else. Julia Westbrooke is the most out celebrity women in America. Julia is an entertainment TV journalist, whose career has blossomed since she announced her sexuality to the world. She is known for fair and honest interviews that get past the gossip and go to the heart of the story. She is very well respected by her audience and the celebrities that she interviews. Siena immediately wants nothing to do with Julia upon meeting her with mutual friends. She is even more dismayed at why her circle of friends keeps including the journalist. No matter how down to Earth they say she is, Siena wants nothing to do with her. Push Pull! Julia of course breaks down the walls Siena has erected and what unfolds in a dazzling story. Overall, I thoroughly enjoyed my time with this romance. If you are a Kindle Unlimited reader this is by far one of the better stories you will pick up and it is worth the $7 price tag if you are not.